The pieces here are chunky and well illustrated. A night under the big top! So much to see! The dancing monkey! The bear on the bicycle! The spinning plates! The elephant! The ringmaster! And this circus promises to be the best of all, as the performers have decided to show off their gravity-defying stunts in new and exciting ways. Can the elephant balance on the monkey? Can the ringmaster hold up the bear? Regardless of what happens, you’re going to want to take pictures because there’s no way your friends will believe you otherwise. 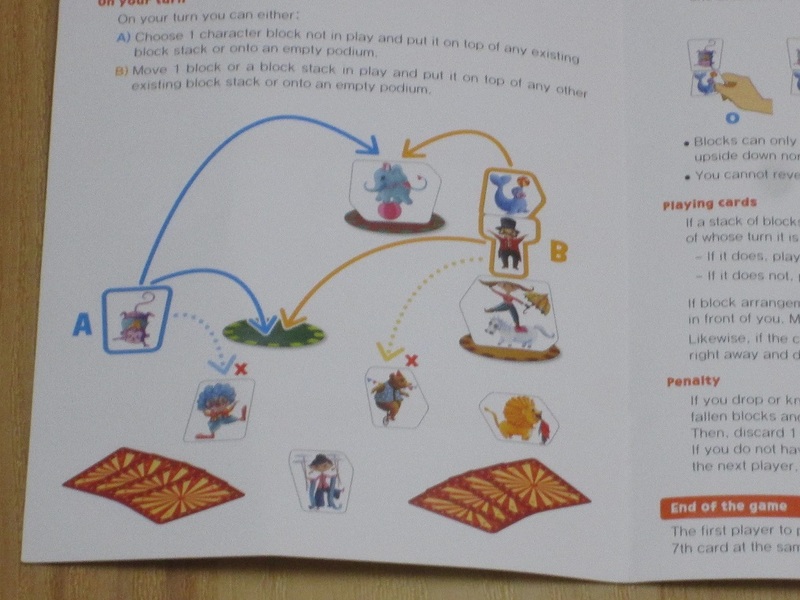 Topito is a logic and dexterity game for two to four players. 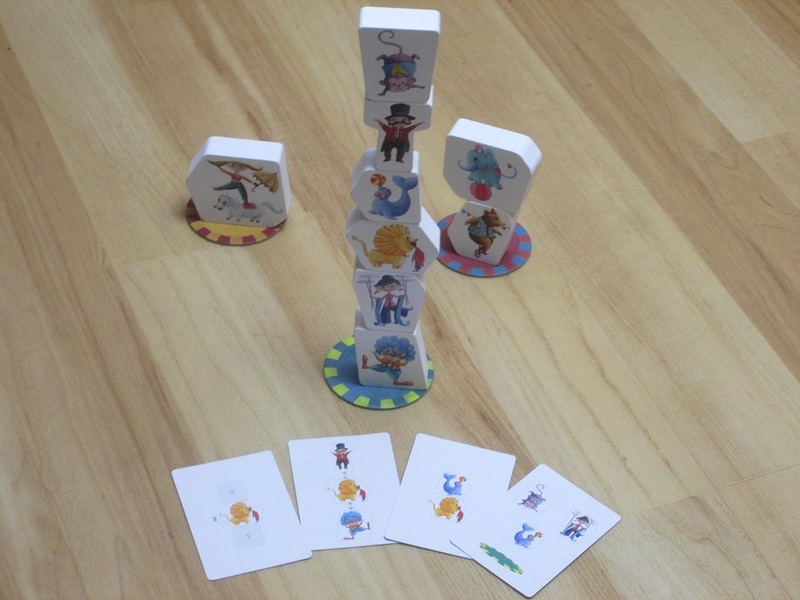 Players are trying to arrange the circus performers on the correct podiums to perform the stunts shown on their cards. The first player to match seven of their stunts wins. 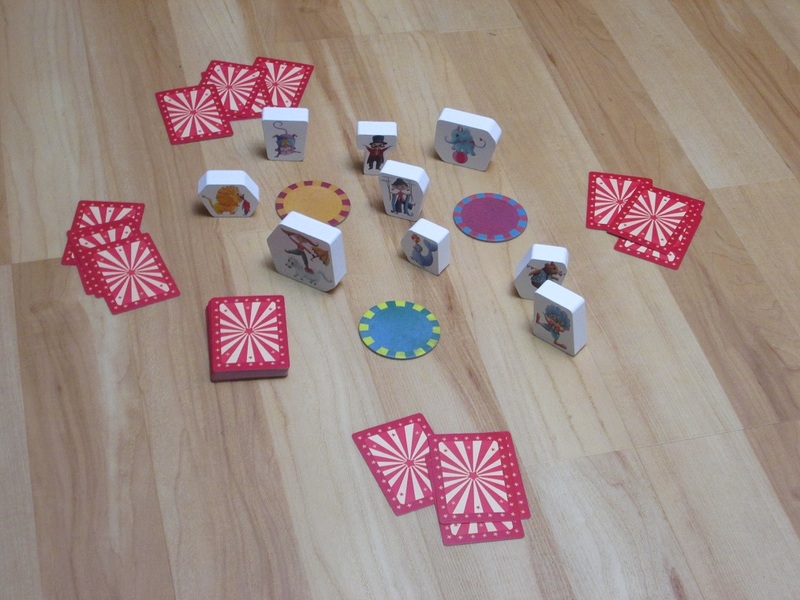 Topito set up for four players. To begin, the three podiums and all of the wooden circus acts are placed within reach of the players. Each player is dealt four cards from the deck. Play begins. 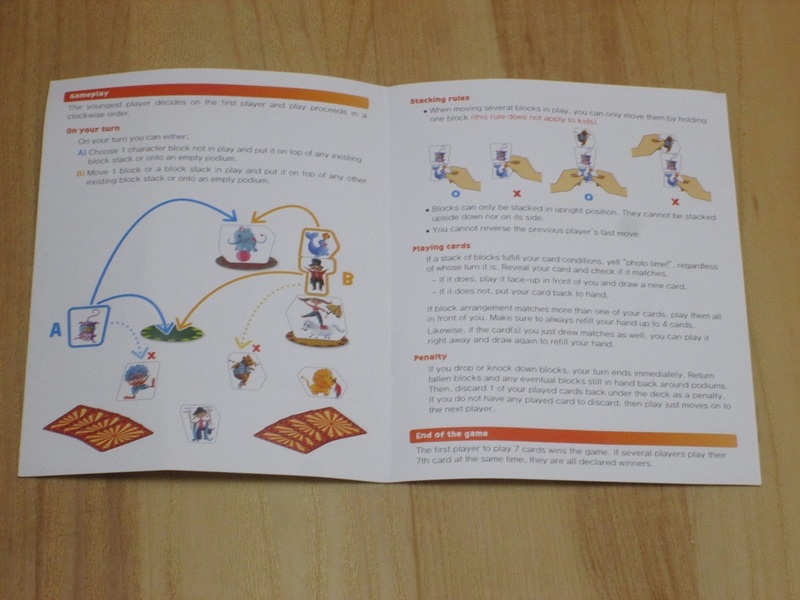 On a turn, players may touch one piece and lift it onto a podium (or another piece–only one piece may touch the base of a podium). If there are pieces above the piece touched, the player must move all the pieces as a stack without dropping them. (The rules specify that children get let off a little easier and may use both hands when moving a stack of pieces.) If a player drops pieces when moving them, that player loses their turn, places dropped pieces in the center of the table, and has to return one of their completed stunt cards. The game ends when a player has played their seventh card. That player wins. Reviewing games for children is a bit of a fraught enterprise. For one thing, I’m not really the intended audience, and the review won’t usually be speaking directly to the intended audience. For another thing, I always so badly want a children’s game to be good and am so often disappointed. Thankfully, Topito occupies some rarefied air in that, while it is a game that children can grasp and play, it’s also a game that won’t have adults counting the minutes until bedtime. Topito combines the right amount of skill and challenge for a variety of ages, making this game the right choice for lots of different family gaming situations. Almost all of the rules for the game fit on a single spread. The first thing you’ll notice in Topito is the inviting theme and colorful artwork. Marie Cardouat’s artwork is whimsical and fun and is also gorgeous, no surprise given her previous work on Dixit and Steam Park. 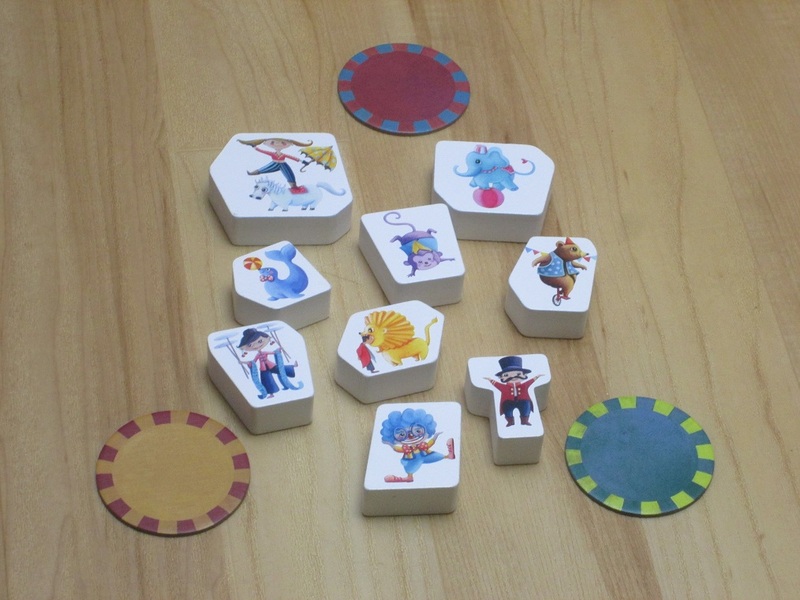 The circus act pieces are on hefty and chunky painted wood–large enough to be grasped by those who might still be working on their fine motor skills, yet still a shaky base for how high the towers tend to go in this circus. 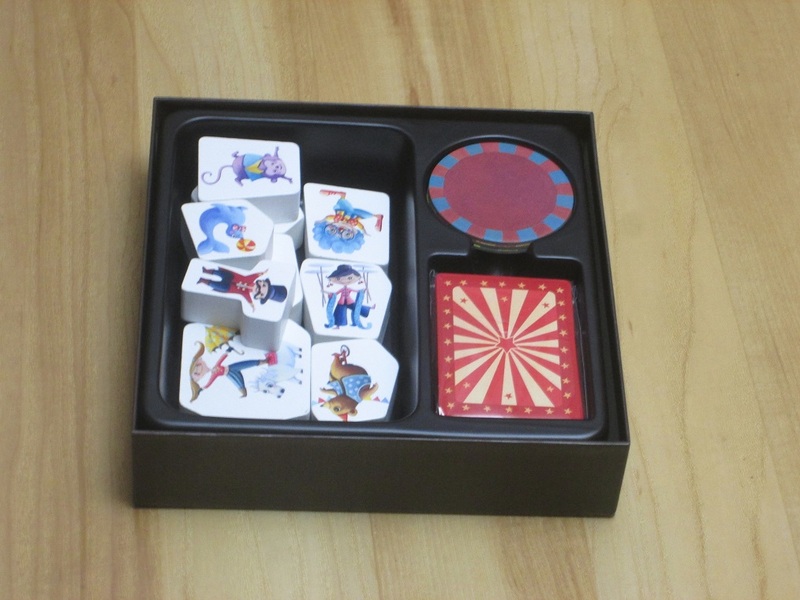 The cards and podium tiles have a linen finish, and all around, the game looks great when it’s on the table. I’m fine with a grimacing European monarch on the box, but when you’re inviting children to the table, presentation matters a little more, and Topito delivers here. And once everyone gathers around the table, the game is fun, too. One thing that makes the game fun is that even when it’s not your turn, if another player arranges the pieces in such a way that the configuration you’re looking for is matched, you can call it out. So even though players take turns in Topito, players are constantly involved and invested in what the others are doing. This works because of the different kinds of cards in the game. Some cards require two pieces to be stacked exactly in the right order. Others might require three pieces to be arranged in an order, but other pieces can come between them. Others just care that the right pieces are on the right podium. And still others just want to see a certain act at a certain place in the tower. Since each turn players can touch just one piece, this prevents other players from guessing what someone is doing and thwarting their move. It really is anybody’s guess. It might not matter, for example, that the bear is being placed on the green podium, just that he’s the third piece in the tower, so it’s hard to play maliciously. And if someone does have a particularly mean streak, the rules are explicit that players can’t undo the move that just happened. And because the cards are so varied in what can be accomplished, it’s not infrequent that players will fulfill their cards on another player’s turn. This particular stack satisfies all four of these cards. It is very possible that another player will arrange pieces in such a way to allow you to claim a card. The fact, too, that players can fulfill multiple objectives at once has them scheming to determine how they can bring their plans to fruition. I need the bear in fourth place, and I also need the bear to be on top of the monkey…how can I make that happen? The task isn’t necessarily difficult (if you’re an adult), but it is engaging. As you are arranging pieces and stacking them higher, you do almost get the sense that you are participating in the greatest show on earth. A helpful diagram shows how pieces can be moved. And here is one of the greatest strengths of Topito: it scales by age. If you’re a child, the logic puzzle is going to be more difficult, so when children move a tower of pieces at once, they can use both hands. Adults aren’t likely to struggle with the logic puzzle as much, so for them, they have to contend with the dexterity element: they may only touch a single piece to move all the pieces above it. This requires some serious dexterity skill–the painted wooden pieces are a little slippery–but it keeps the game from favoring one age range and also keeps the game competitive. For adults, Topito is almost a push-your-luck game: how many pieces are they willing to attempt to move at once given that they lose their turn (and an already-completed card) if they fail? The insert keeps everything in place. I don’t mean to oversell Topito–it’s primarily a game for children. I don’t intend to bring it out at game night (although if it happened, I think people would have a fine time with it), and I’m not likely to play it after the kids are in bed. But after countless games of Uno and other games where luck is the sole determinant of the winner, it’s refreshing to find a game that challenges players of all ages to think logically and captivates young imaginations while making playtime with adults less of a drudgery and more of a delight. I plan to hang on to this one, and may Topito’s tribe of kid- and adult-friendly games increase. 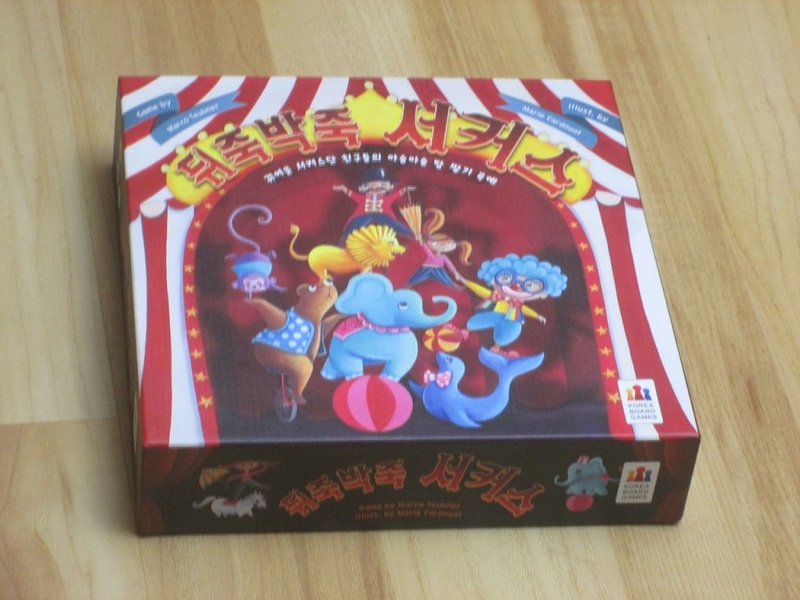 iSlaytheDragon would like to thank Korea Board Games for providing us with a copy of Topito for review.